Testimonies from just some of our many satisfied customers from Coast to Coast! Thank you for such a speedy response and also for keeping your word about swap meet price. Girlfriend mentioned needing chaps, I didn’t say a word. They will be delivered to her house probably Tues. She will be so happy and surprised. These chaplets are wonderful. 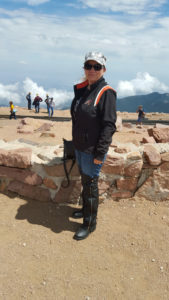 They kept me warm atop Pikes Peak and other Colorado mountains during a recent vacation. They are very comfortable. One day after coming down from the mountains we got stuck in construction and it was slow moving and got hot very quickly. As a passenger on a bike, it was very easy for me to remove them quickly without even getting off the bike! Love my chaplets!